Interest in ancient Hebrew texts as a source for understanding Christianity started in the 1480s, and, thanks to the invention of the printing press, spread throughout Europe. It culminated in the publication of one of the first Hebrew grammar books and dictionaries for Christians, De rudimentis Hebraicis in 1506, written by the most eminent Christian Hebraist of the time, Johannes Reuchlin (1455-1522). The book was met with strong objections from the Catholic Church, and Johannes Pfefferkorn—a recent convert from Judaism—published several treatises championing the confiscation and burning of all Jewish books. While the majority of Christian experts enthusiastically endorsed book confiscations, Johannes Reuchlin, an attorney by training, argued forcefully against this policy on both legal and moral grounds. The significance of the Reuchlin Controversy on the development of humanism can hardly be overestimated. Reuchlin’s Der Augenspiegel documents an important historical milestone on the road to the toleration and acceptance of Judaism, and is the centerpiece of the Frank L. Herz Rare Book Collection at the Leo Baeck Institute. Many of these books can be seen in Burning Words, alongside other materials from the collections of the Leo Baeck Institute. This exhibition is generously supported by The David Berg Foundation. “Burning Words” explores the 16th-century debate carried out through the relatively new medium of printed books over whether Jewish books should be confiscated and destroyed. This talk will focus on Johannes Reuchlin, a German scholar of the period, who strongly advocated in favor of Jewish books, stressing the importance of Jewish ideas in the Christian world. Columbia University’s Elisheva Carlebach, a scholar of early modern Jewish history who wrote the introduction to an influential translation of Reuchlin as well as “Divided Souls: Converts from Judaism in Germany, 1500 – 1750,” will lead this evening lecture. 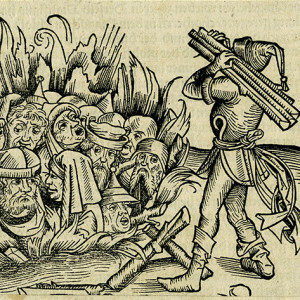 “Burning Words” takes its name from the stage play by Peter Wortsman, which dramatizes the clash between the humanist jurist Johannes Reuchlin and Johannes Pfefferkorn, a Jewish butcher converted to Christianity and a willing tool of the Dominican Order in their quest to burn Jewish books. This dramatic reading of scenes from the play will feature scholarly commentary from Magda Teter (Fordham) and the playwright as well as a multimedia presentation of books, contemporary artwork and cantorial music transcribed and arranged by Reuchlin himself.